The wild white cattle which roam the huge expanse of Chillingham Park are perhaps the region’s most treasured natural curiosity. But they are not to be messed with, for they really are genuinely wild. Of ancient descent (no one knows quite how old), they have remained hemmed in and protected, yes, but you wouldn’t want to casually wander across the park amongst them… for there’s a pretty good chance they’d have a go at you. Though they are undomesticated and quite often aggressive, they are very, very special specimens. Numbering around 100, they are rarer than pandas and genetically identical to one another, such is the depth of their inbreeding. They are the purest of pure-breds, and are therefore very carefully looked after and highly prized by us North-Easterners. However, despite their importance they have not always been as well protected as they are today. 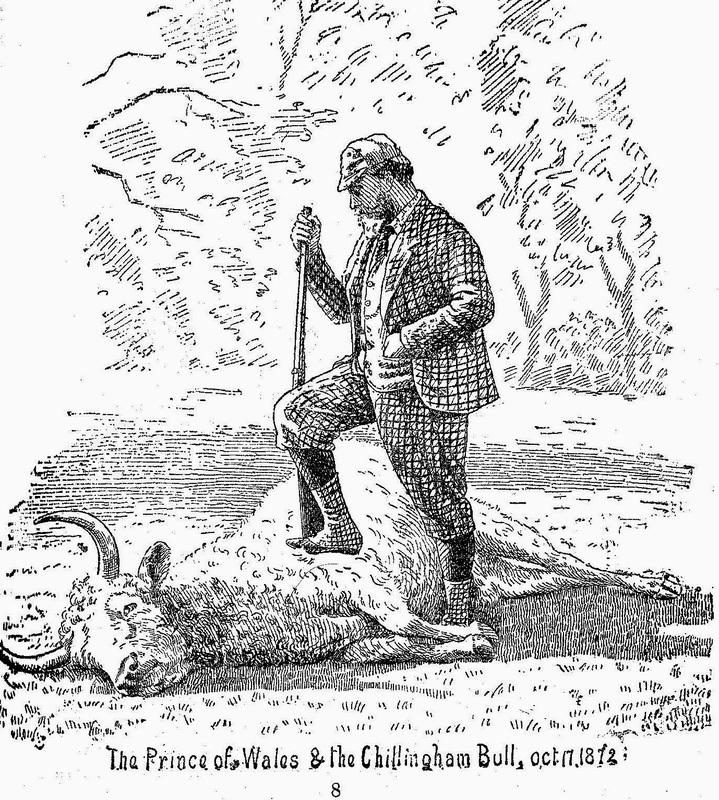 Amazingly, as recently as October 1872, the prize Chillingham Bull was slain in the name of sport by Edward, Prince of Wales. His Royal Highness brought down the king of the herd by a single rifle shot, his bullet entering the neck and severing the spinal cord. It was a fine bull, seven years old, and weighing 70st. It was, as was later reported, “scarcely a feat to warrant any unusual jubilation”, yet the ‘achievement’ was captured for posterity by a photographer when the beast was shoved under the royal foot on the castle lawn later that day. The sketch shown above was copied from the said snap and published in The Monthly Chronicle of North-Country Lore & Legend in March 1889. The bull’s head was mounted and found its way to the hall at Sandringham in Norfolk. Is it, I wonder, still there? Hi, any chance the author could possibly drop me a line mattcross260@gmail.com I have a question!